Love that large heart with all the colors underneath. I love your journaling around the heart with the buttons adding a pop of color! This is so gorgeous! I love the rainbow pinata strips in the heart and the buttons you used in the word art around the heart! Your shadows are perfect too! This is so fun and creative!!! Love it, Heather! I love everything about this page! The colors, the flowers, and the beauty! 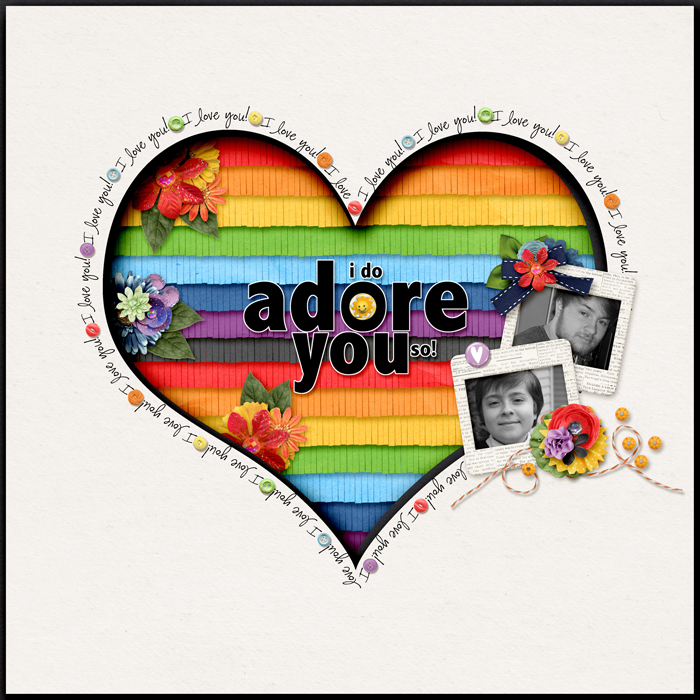 The bright colours are awesome behind the heart and I love the journalling and buttons that goes around it! Wow! This is amazing! I love the big heart and the vibrant colors with those black and white photos. Love all of the details here... the shadowing, the journaling around the heart, the b/w photos... beautiful page! And you mentioned a designer I have never heard of... guess I missed that one LOL! This is so beautifully colorful! I love the words and buttons around the edge of the heart. I love the words (with buttons!) going around the heart! Oh that fringe! And the large black title is just perfect to pop!